Audience in the playing hall of the match Anand – Topalov saw a normal start of round 3 with a full house of journalists and many interested chess fans ready for a battle. The game entered into a well known Slav variation, where white plays with slight advantage and black can draw with precise moves (replay game here). Exactly this led to theoretical discussion not on the board, but rather on the rules of the World Chess Championship. After the bishops were exchanged at move 33, the game entered a dead draw position. Topalov and Anand kept on playing. After the time control on move 41, Topalov went to get the arbiter and according to the audience in the playing hall seemingly requested a draw. The arbiter went to the board, but Anand did not look at him and executed his next move, thus continuing the game. The arbiter stayed until the threefold repetition. Observers from the hall confirm there was no handshake at the end of the game. Chessdom.com journalists and the players themselves confirmed there was no handshake after the game. Update 2: The players at the press conference said they simply forgot to shake hands at the end of the game. 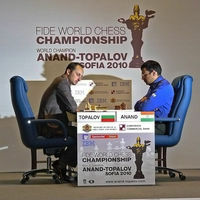 Update 3: After the third game, Anand and Topalov have undergone doping control. For the procedure in Sofia has arrived the head of the doping commission of FIDE, Anna Belin from Chech Republic. She was the same person that performed the doping control in Elista. The procedure in Sofia has taken place in two separate rooms in the Military Club in Sofia.